Welcome to BBQ Station, home of the best BBQ in Southern Missouri! BBQ Station is a great little BBQ restaurant, and once you walk through the front door, your nose will tell you that you’ve found some of the best BBQ in Southwest Missouri! They also serve a mean hamburger, and the staff is one of the friendliest you’ll find at any burger shack. Dine in and enjoy the vintage decorations on the walls in the dining area, or ask for carry-out. Either way, you’re going to love this place. 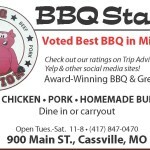 Food lovers on social media have voted this restaurant Best BBQ in Missouri — proof-positive that you just won’t find better BBQ in this part of the Ozarks than BBQ Station! Located at 900 Main St. in Cassville, just a short walk from Cassville’s historic downtown city square. Ribs, chicken, pork and homemade burgers top our menu favorites here.